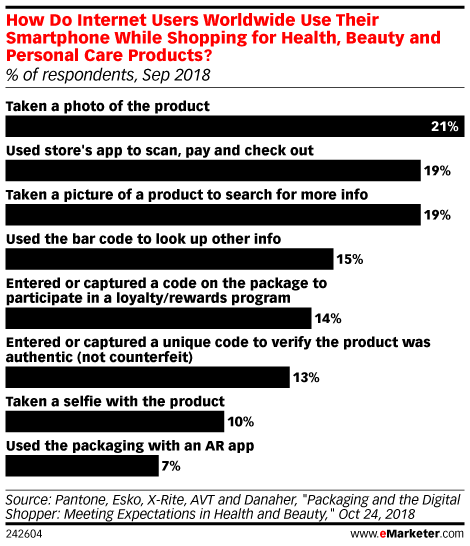 Data is from the October 2018 Pantone, Esko, X-Rite, AVT and Danaher report titled "Packaging and the Digital Shopper: Meeting Expectations in Health and Beauty." 3,000 internet users worldwide ages 20+ (2% were under age 20) were surveyed online during August 16-September 14, 2018. Respondents identified themselves as the primary shopper of health, beauty, or personal care products or having shared responsibility. Respondents were from North America (n=1,000), France, UK, Germany, and Spain (n=1,000 in total split between each country), China (n=500) and Japan (n=500). Pantone is a color matching system company. Esko is a graphic arts software company. X-Rite is a color management system and software solutions company. Advanced Vision Technology (AVT) is a print process control for the packing, label and commercial print industries. Danaher is a global science and technology innovator company.